Having begun to roll out a tourism master plan that puts the spotlight on natural and cultural assets, Brunei Darussalam is targeting an 8% increase in visitor numbers this year. Under the plan, which will be introduced in stages, the Sultanate aims to revive areas of historical significance, while also drawing visitors to its islands and nature reserves. A drop of five places in a major international survey has served to highlight the challenges the tourism industry faces, which include infrastructure deficiencies and low levels of foreign investment. On March 1, the Tourism Development Board (TDB) said it planned to attract 260,000 visitors this year, up from the 241,426 who visited the Sultanate in 2012. The announcement came after the ministry confirmed last September that its 2011-15 Tourism Master Plan had been finalised. Bandar Seri Begawan, 23 April 2013 - THE Permanent Secretary at the Ministry of Culture, Youth and Sports, Hj Mohd Rozan bin Dato Paduka Hj Mohd Yunos, has expressed his concern on the contemporary obsession by youths in the digital entertainment, contributing to the lack of passion in the habit of reading in this country. This would lead to many of them dependent on information acquired from the social media, he said at the Library Open Day for the World Book Day 2013 held at PTE Katok yesterday. BANDAR SERI BEGAWAN, April 22 (Xinhua) -- Negara Brunei Darussalam, officially the Nation of Brunei, is a tiny Southeast Asian country you can barely spot on a map. Regardless its tiny territory and small population, Brunei is often trotted out as an ideal Islamic state -- stable and prosperous, and with an educated and moderate Muslim society generally enjoying a high quality of life. The sultanate has the second highest Human Development Index among the Southeast Asia nations after Singapore, and is classified as a developed country. The International Monetary Fund (IMF) puts Brunei in the fifth place around the world in terms of gross domestic product (GDP) per capita at purchasing power parity. The IMF also stated in a 2011 estimate that Brunei was one of two countries (the other being Libya) with their public debt at 0 percent of the national GDP. BRUNEI Darussalam’s first two participants at the Marathon des Sables (MdS) – inarguably the ‘toughest footrace on earth’ – Hamsul Sulaiman and Ahmad Fathi Junaidi – returned home safely midnight yesterday, after successfully completing the gruelling 250-kilometre annual race, held in the Southern Moroccan Sahara Desert. Present to greet them upon arrival was the Permanent Secretary at the Ministry of Culture, Youth and Sports, Awang Haji Mohd Rozan bin Dato Paduka Haji Mohd Yunos, as well as friends and families who cheered and congratulated the brave men’s return. Berakas, 17 April 2013 - THE Survey Department announced new and amended names for roads in the Brunei-Muara District, approved through the National Committee of Geographical Names (JKNG). The list and information of new names and amended names for main roads within the Jalan Daerah Brunei-Muara District are as follows. Tungku Highway is the name of the road starting from Interchange Sultan Haji Hassanal Bolkiah (SHHB) Highway in front of Kg Menglait towards the highway T-junction in front of Muara-Tutong Highway. Rimba Highway starts from the Second Interchange of Tungku Highway in front of the traffic light, and leading towards the Rimba National Housing area until towards the T-junction in front of Muara-Tutong Highway. Jalan Rakyat Jati Rimba is the name of the road at STKRJ Tungku that start from the traffic light leading towards the T-junction, Jalan Gadong. Bandar Seri Begawan, 18 April 2013 - THE Municipal Department has announced new and amended road names within the municipal area of Bandar Seri Begawan approved through the National Committee of Geographical Names (JKNG). The list and information of new and amended road names within BSB Municipal area are as follows. 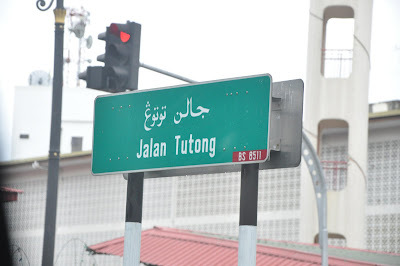 Jalan Pengiran Muda Al-Muhtadee Billah is the name of the road starting from the front of Gadong crossroads in Kampong Beribi which is Jalan Gadong and in front of Jalan Telanai towards the roundabout on the right side of Kawasan 1 Perpindahan Mata-Mata. Jalan Raja Isteri Pengiran Anak Saleha is the name of the road in Kampong Telanai starting from the T-junction in front of Jalan Sultan (in front of Fire and Rescue Station) towards the T-junction of Jalan Telanai. Jalan Permaisuara is the name of the road in Kampong Beribi starting from the T-junction (Spg 87) in front of Jalan Babu Raja until the T-junction (Spg 111) in front of Jalan Telanai. 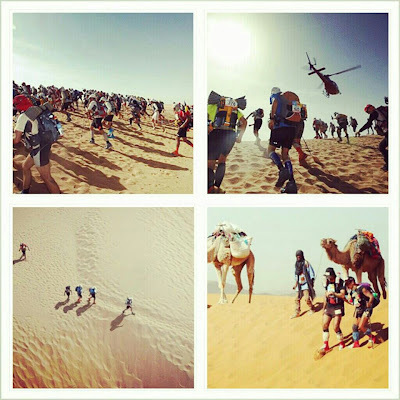 Our two runners from Brunei Darussalam, Ahmad Fathi Dato Junaidi and Hamsul Sulaiman have just completed the toughest marathon in the world, officially called Marathon des Sables 2013 running across the Sahara Desert in Morocco. I can only say, CONGRATULATIONS AND WELL DONE! Not that many people are willing to run 156 miles in the searing Saharan Desert carrying your own food rations and other requirements with you. WELL DONE again. Gravel Quarry of Old Brunei written by Haji Mohd Daud Haji Abd Rahman THE industrial mining of gravel has been carried out in Brunei for a long time. Gravel is needed for all sorts of activities especially construction. Now not many recall the name of Kampong Butir. An hour away from Kianggeh, Kampong Butir used to be the main place in Brunei where gravel was quarried from the earth. 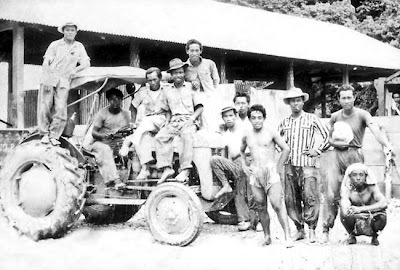 The village residents of Kampong Butir comprised the Kedayan community, one of the seven ethnic Malay tribes of Brunei. Most of the villagers were subsistence farmers and fishermen, who earned a living by cultivating the soil and harvesting the river. Kampong Butir rose to prominence when people started mining for gravel and it was found in abundance there. Workers would dig the soil to extract the gravel. From Kampong Butir, the gravel was transported to gravel processing sites using wooden barges known as ‘tongkang’ and ‘kumpit’. Bandar Seri Begawan, 11 April 2013 - THE Ministry of Culture, Youth and Sports (MCYS) together with the United Nations Educational, Scientific and Cultural Organisation (UNESCO) yesterday organised a forum briefing entitled ‘UNESCO’s Intangible Cultural Heritage Convention’. The forum brought together representatives from the Ministry of Culture, Youth and Sports; Ministry of Home Affairs; Attorney General’s Chambers Office; along with district officials, local representatives, academics from Universiti Brunei Darussalam, local NGOs, as well as experts and policy makers in the field of culture, to discuss regarding the safeguarding and promoting of the country’s Intangible Cultural Heritage (ICH). In addition to that, it also provided further information on UNESCO’s implementation strategy for the ICH Convention and efforts to strengthen internal networks amongst different levels of stakeholders. Around five photographers including a driver from the History Centre went to Bukit Salat – situated near the Kampong Bukit Salat housing area, surrounded by the Kedayan River and opposite the High Court – to conduct a study on the ancient tombstones located at the old cemetery. Based on survey results and the cemetery land research, the cemetery existed since the early 1940s before World War II. 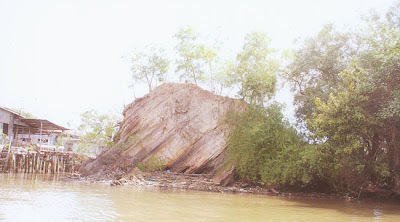 In the early 1950s, Bukit Salat was full of bushes with big trees, which covered the existence of tombstones and was not visible when travelling by boat. The height of Bukit Salat is about 50 feet, and during the study it was found that there were three old tombstones where one was on top and the other two were found on the slope. The tombstone found on top of Bukit Salat in the shape of a square, where according to studies, it was possibly owned by a Pengiran or Ampuan. Bandar Seri Begawan, 7 April 2013 - Permanent Secretary at the Ministry of Culture, Youth and Sports Awg Haji Mohd Rozan bin Dato Paduka Haji Mohd Yunos yesterday underlined that locally produced literary works can help generate high returns for the creative industry. He said this during the launch of the 41st General Meeting of Literature Writers (ASTERAWANI) which was held at the Language and Literature Bureau near the Old Airport Road. 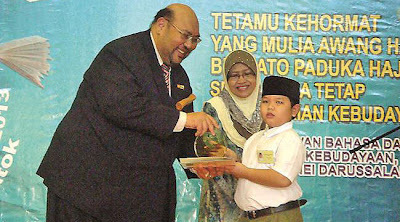 Locally produced literary works can be created, published and marketed, he said, before going on to explain that this would not only be a treasure to the future generation, but could also steer them towards strengthening the cultural importance of the Malay race in the context of the Malay Islamic Monarchy (MIB) philosophy which is unparalleled in value. Bandar Seri Begawan, 6 April 2013 - THE call to raise awareness upon students as well as the general public on the importance of literature was lauded by Haji Mohd Rozan bin Dato Paduka Haji Mohd Yunos, Permanent Secretary at the Ministry of Culture, Youth and Sports during the launch of Literature Festival 2013. Haji Mohd Rozan highlighted the role of the festival in raising awareness; establishing knowledgeable, informative, visionary, high integrity, competitive and creative Brunei community to improve the religion and country. Bandar Seri Begawan, 5 April 2013 - THE Yayasan Sultan Haji Hassanal Bolkiah handed over $100,000 to the Gaza people humanitarian fund and another $50,000 to the Philippine Bopha victims humanitarian fund yesterday. Both contributions were presented by Chairman of the Yayasan Board of Directors, Pehin Orang Kaya Seri Kerna Dato Seri Setia (Dr) Hj Awg Abu Bakar bin Hj Apong to the Minister of Culture, Youth and Sports, Pehin Orang Kaya Pekerma Laila Diraja Dato Seri Setia Awg Hj Hazair bin Hj Abdullah.